Great Western Hunting Camps in southern Colorado provides big game hunting at its finest! Terry Trumble (owner/outfitter) focuses on a personal and quality hunting trip that you will remember for a lifetime. 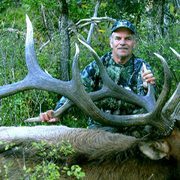 Not only do they provide some of the best elk hunting opportunities that Colorado has to offer, they also offer exceptional mule deer hunting, trophy antelope, and the finest whitetail hunting in Colorado. All the hunts take place on private land so the animals are managed and are not heavily pressured. We experienced first hand how incredible this area of Colorado is for all big game species.